for all your subaru needs! 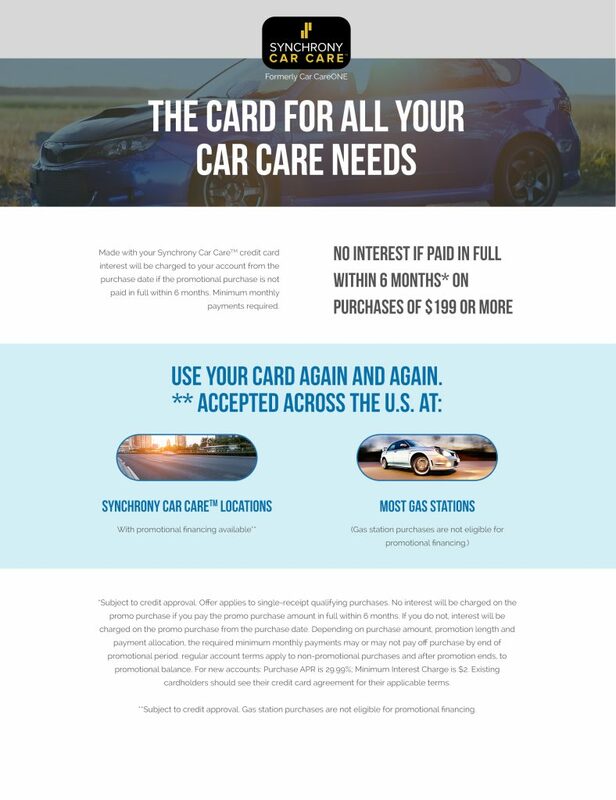 Subaru Clinic has so many deals and specials (see our specials page for more), and now we are offering the opportunity to apply for a Synchrony Car Care Card. With this special deal, you can make purchases of $199 or more and pay no interest as long as you are making your minimum monthly payments, and pay off your balance within the first 6 months! An opportunity like this is an important one to take advantage of—especially if you have a big purchase you have been planning on! While lump sum purchases aren’t always possible, the ability to pay your purchases off month by month can make exciting upgrades and purchase possible for anyone! Call Subaru Clinic today for any questions about this special Synchrony Car Care Card, and how to sign up. Subaru Clinic has been in business in Broomfield Colorado since 2007. We specialize in service, maintenance, and repairs of many Japanese vehicles but our main specialty is working on all models of Subaru vehicles. With outstanding AWD and optimum performance, Subaru is one of the best vehicles you can own in Colorado. By bringing your car to Subaru Clinic, you choose great services with great rates. Subaru Clinic is a family operated company that takes pride in superb customer service and the highest quality car repair and maintenance available. Did you know that the Japanese word “SUBARU” means “unite” or “gather together”? It is also a name for the Pleiades star cluster in the constellation Taurus, which has six visible stars and 250 bluish stars visible through a telescope. These visible stars are depicted in the logo of the Subaru. Subaru is produced by Fuji Heavy Industries Ltd, which was formed by the merging of five Japanese companies in 1953. The first president of the company was Mr. Kenji Kita. He believed that Japanese automobiles should have Japanese names. He is the one who gave the beautiful Subaru name to the first 1954 prototype of the first passenger car.